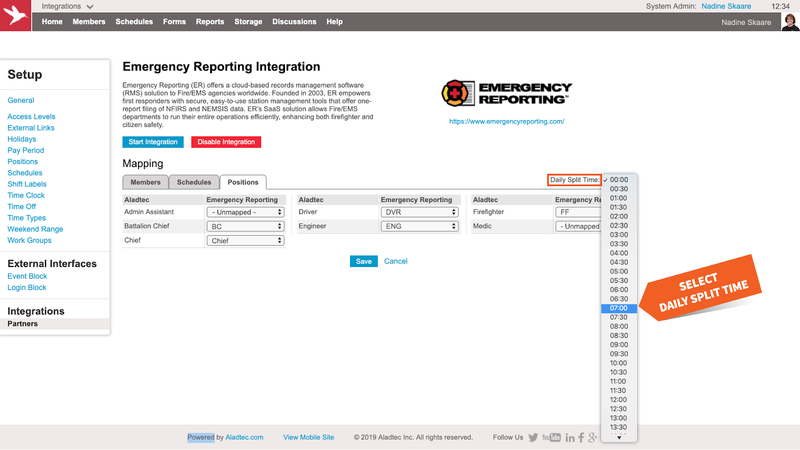 Aladtec can be easily integrated with Emergency Reporting (ER). 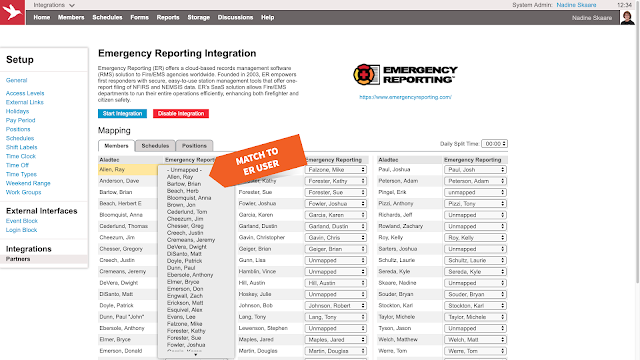 With the Emergency Reporting integration, Aladtec will automatically feed schedule information to Emergency Reporting Daily Rosters, eliminating the time-consuming and error-prone task of duplicating schedule data. After the Emergency Reporting integration is enabled, Aladtec will seamlessly create and update Emergency Reporting Daily Rosters with Aladtec scheduling information. Every fifteen minutes, Aladtec will ensure the scheduling information from yesterday, today, and tomorrow is in sync with Emergency Reporting’s daily roster information, including any changes to Aladtec schedules, such as trades, time off, and sign ups. 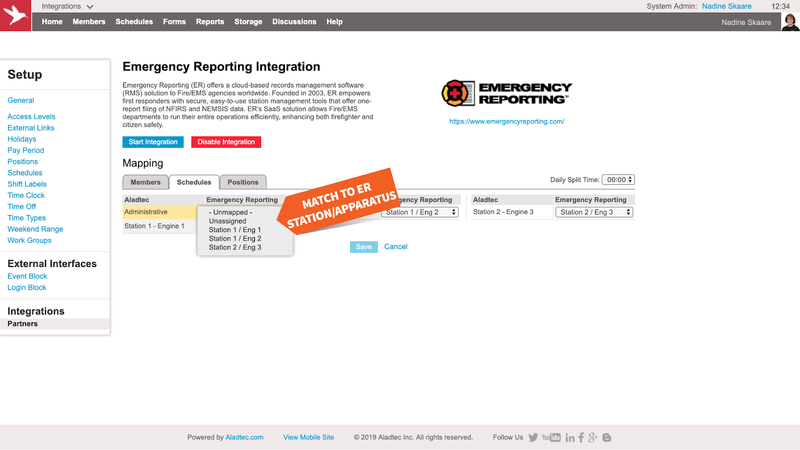 Enabling the Emergency Reporting integration is easy. 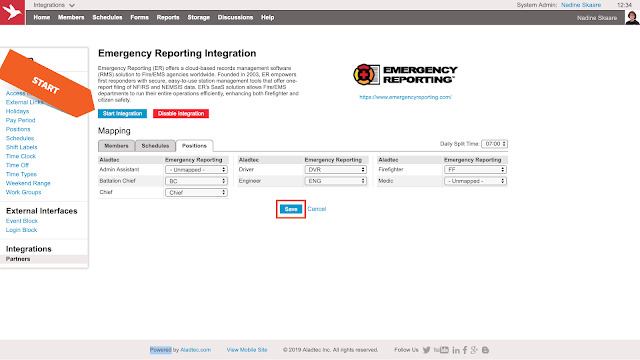 First, contact Aladtec support (support@aladtec.com or 888.749.5550) to activate the Emergency Reporting integration. Then, create a new user in Emergency Reporting. In Aladtec - Setup - Integrations, after enabling, enter the credentials and authenticate, as shown below. Once the Emergency Reporting credentials are authenticated, Aladtec will automatically retrieve Emergency Reporting data, including all users, stations, apparatus, and positions. After the data is retrieved, to sync data to Emergency Reporting, match Aladtec data to Emergency Reporting data as described below. 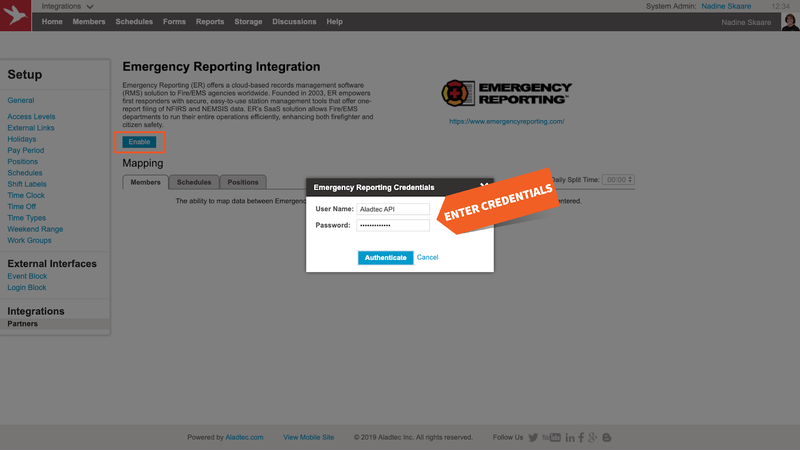 Aladtec Members will be automatically matched to Emergency Reporting Users, if possible. For any Aladtec Member that does not match an Emergency Reporting User automatically, select the correct Emergency Reporting User from the provided list, as shown below. Similar to matching Aladtec Members to Emergency Reporting Users, match an Aladtec Schedule to an Emergency Reporting Station - Apparatus pair. See below for an example. Each Aladtec Position can be matched to one Emergency Reporting Position. Matching positions is optional. In the example below, Aladtec Positions have been matched to Emergency Reporting Positions. Daily Split Time defines the time each day starts/ends in the Emergency Reporting Daily Roster. Select the Daily Split Time, an example is shown below. After the Aladtec to Emergency Reporting matching has been completed and the Daily Split Time is selected, save the matches and start the integration, see below. Options to temporarily stop the integration or permanently disable the integration are provided as well. For questions or additional help with the Emergency Reporting integration, please contact the Support Team at support@aladtec.com or 888.749.5550. For questions or additional help with Emergency Reporting, please reach out to Emergency Reporting. As always, thank you for using Aladtec!